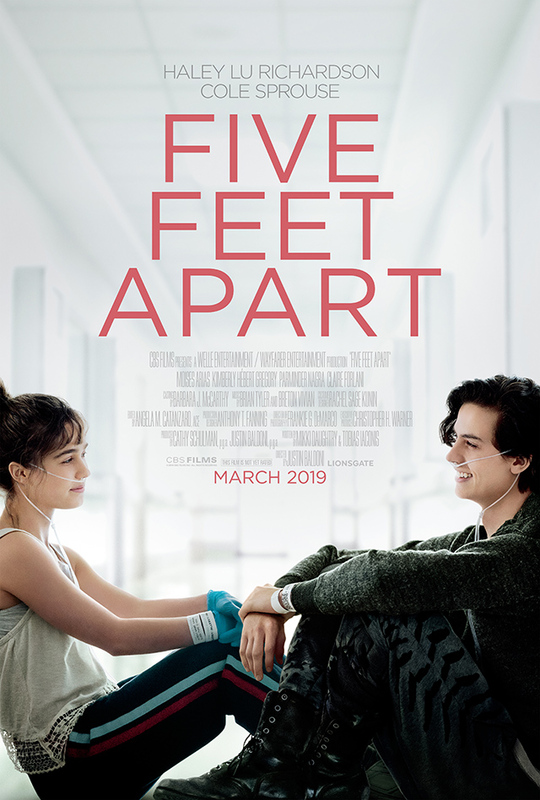 CBS Films has released a brand new trailer for their upcoming teen romantic drama Five Feet Apart, highlighting the two main character’s determination to live for each other. Starring Riverdale‘s Cole Sprouse and Split‘s Haley Lu Richardson, the film is set to hit theaters on March 22. Check it out in the player below! Written by Mikki Daughtry and Tobias Iocanis (The Curse of La Llorona) and directed by Justin Baldoni (Jane the Virgin), Five Feet Apart follows seventeen-year-old Stella Grant (Richardson) who, after living most of her life in the hospital due to cystic fibrosis, meets the charming Will Newman (Sprouse), also a CF patient. While there’s an instant connection between the two, their health conditions restrict them from coming too close to each other, and Stella must try and save Will, who rebels against his ongoing medical treatments. The film is being produced by Cathy Schulman, who executive produced the 2016 acclaimed coming-of-age teen comedy The Edge of Seventeen, which also starred Richardson, and will co-star Moises Arias (The Kings of Summer), Kimberly Herbet Gregory (Vice Principals), Parminder Negra (Elementary), Emily Baldoni (Rizzoli & Isles), Gary Weeks (Marvel’s Cloak & Dagger) and Claire Forlani (Hawaii Five-0). The post Five Feet Apart Trailer: When Life Forces You Apart, Love Grows Stronger appeared first on ComingSoon.net.